Supports High DPI displays on Windows 10. Also runs on Windows 7. 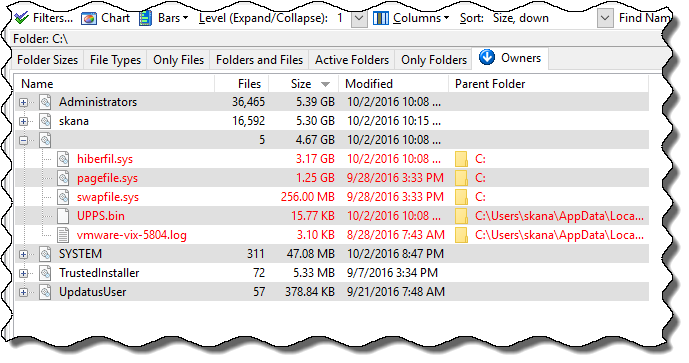 Locate large, space-hogging folders, files, file types, and file owners for disk space clean up on Windows 10. Supports Windows Servers too. Includes advanced features needed by Admin users. Also see: "Four remarkable features that you may not find in other software." New! ShowSize 6 released with better support for Windows 10. See Recent Features for a quick overview of new stuff in ShowSize 6. Folder Sizes list: Click to Read. Disk Usage Chart: Click to Read. 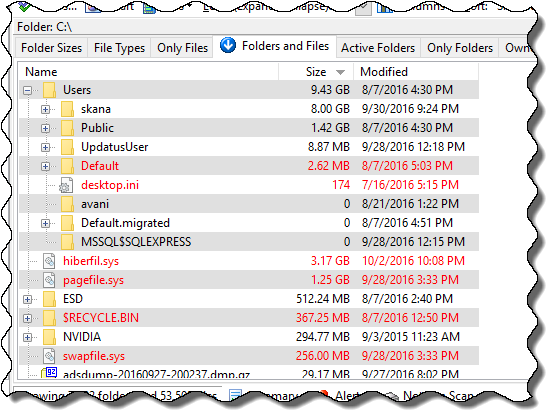 File types list: Click to Read. Only Files flat list: Click to Read. Folders and Files list: Click to Read. Active Folders list: Click to Read. Only Folders flat list: Click to Read. Owners list: Click to Read. Click here to see the next slide that explains the "Exclude Folders" feature in ShowSize. In this screenshot, I "excluded" common Windows folders to speed up the scanning operation that finds folder sizes on the whole drive. The excluded folders are shown as "striked out" in the left pane of ShowSize. Modern disk drives are huge and you should always use this feature in ShowSize to save your time. Excluding such folders also saves you from trouble because you are not supposed to directly delete stuff from Windows' own folders. Let's drill down the earlier Folder Sizes list to get more information. Click here to proceed. Coming back to the earlier Folder Sizes list, let's drill down further for more information. I clicked on the largest folder within Users to expand it further. 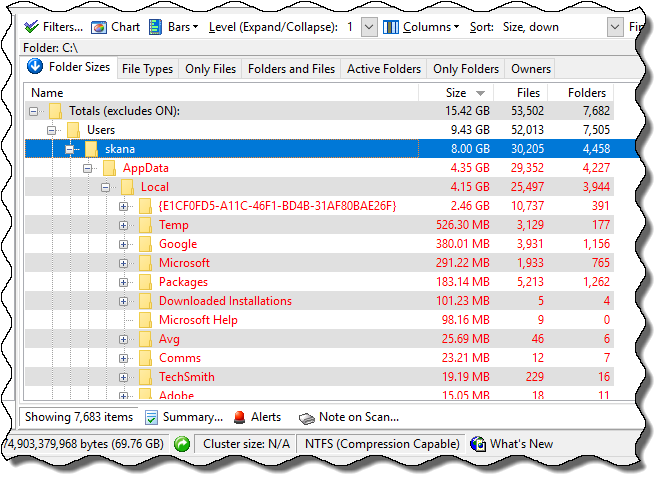 As you can see, AppData internal folder is the one taking up most disk space. Why does it appear in "red?" Because it's a system folder that you are not supposed to edit directly. I'm not editing it but merely examining it to see what takes up the most disk space. I can continue this drill down to any level. 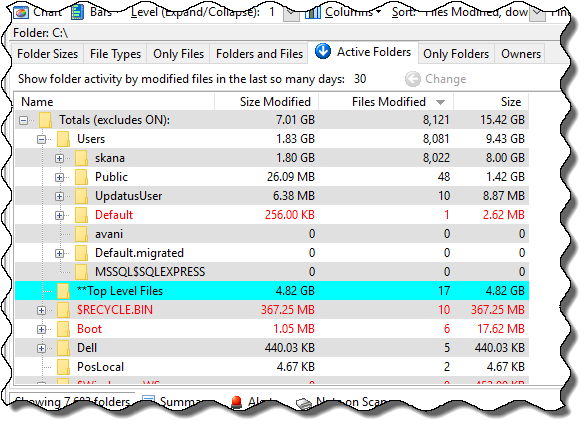 The point is that even though you should not directly delete stuff from such system folders, by drilling down, you can get enough clues on what is taking up the disk space. Let's see what operations ShowSize supports on such a list. Click here to proceed. Now let's see what operations you can perform on the Folder Sizes list? The screenshot shows the right-click menu where you get to perform many useful actions on one or more selected items. 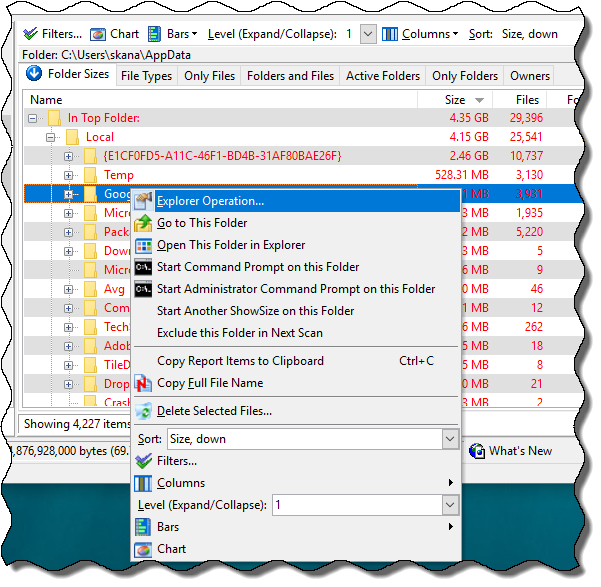 For example, "Explorer Operation" shows you exactly the same menu that you see in Windows File Manager's right-click menu. Other useful operations are self-explanatory. "Delete files" lets you conveniently delete selected items. By using the toolbar buttons above, you can choose what columns to show, expand the tree to any level, filter items by size or perform sort on any column. You can see a pie chart by the Chart button. Click here to see a Pie Chart example. 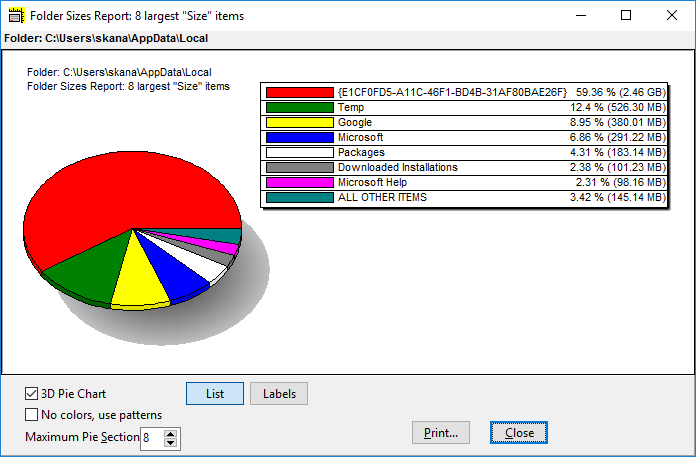 You can also view a pie chart of up to 32 largest subfolders in the selected folder. In order to see the pie chart, you must sort the list on the Size column. 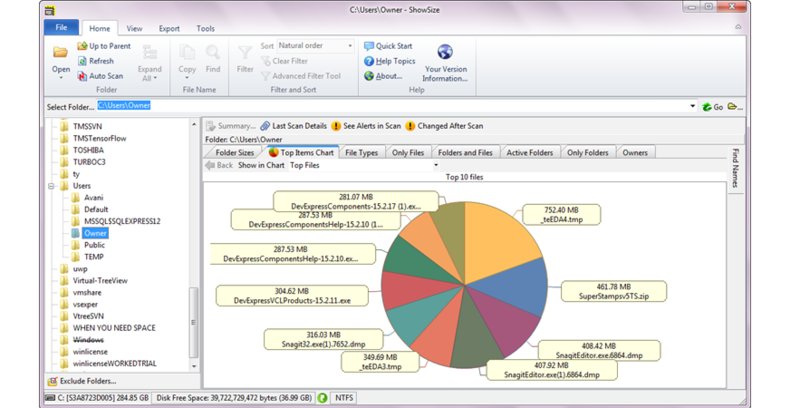 You can see a pie chart on number of files too, provided you sort on that column. You can show more than 8 items by using the pull down "Maximum Pie Sections." Pie chart has some other options too, for example, to show labels next to the sections, show in 2D or 3D, show patterns instead of colors for monochrome printing. Let's see what other folder and file lists are available in ShowSize. Click here to proceed. Take a look at the next list in ShowSize. Click here to proceed. Use ShowSize and you will uncover lots of such interesting facts. Take a look at the next list in ShowSize. Click here to proceed. 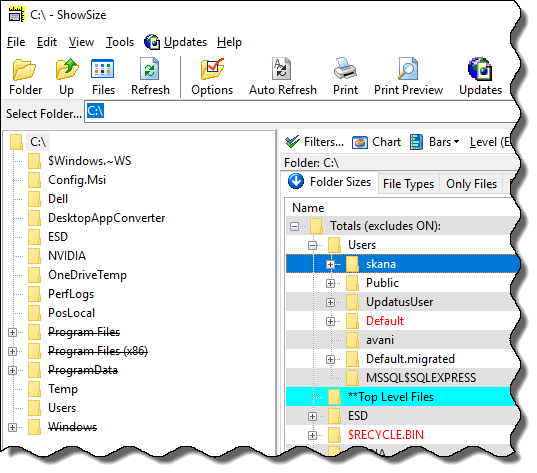 Use ShowSize and you will get many such insights into file programs and their pros and cons. Take a look at the next list in ShowSize. Click here to proceed. This is another innovation in ShowSize. 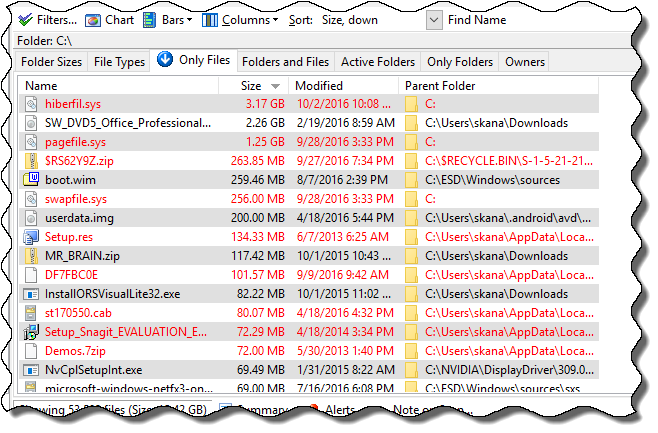 By using "Only Files" list, you can see all the files in one flat list. If you didn't realize, read again. You see all the files, includng hidden files and even those in all subfolders, in a single flat list. This means, you can quickly find the biggest or latest modified files by doing a sort on that column. This is another huge list that ordinary software can not handle. If you run it on the root of a huge drive, the number of files can run into millions. Similar to the "Only Files" list that you saw earlier, this "Only Folders" list in ShowSize shows all the folders in one flat list. You get a similar new perspective on folders that you won't find in other software. 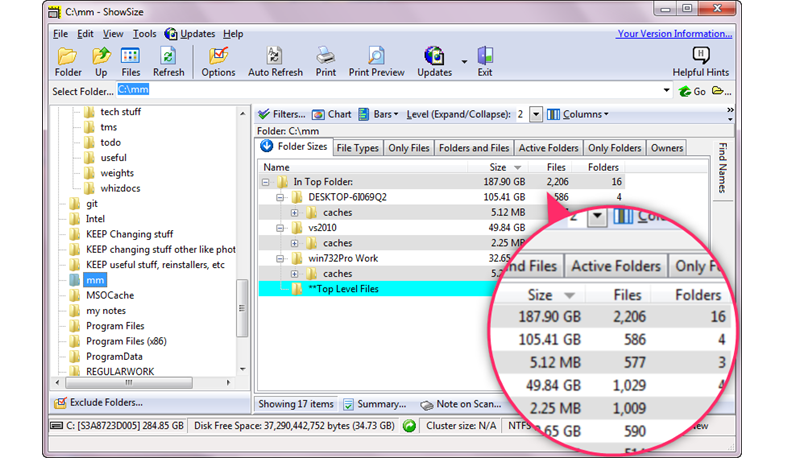 For example, you can quickly find the biggest or latest modified folders at any level by doing a sort on that column. ShowSize has some other unique and innovative features. Click here to know more. 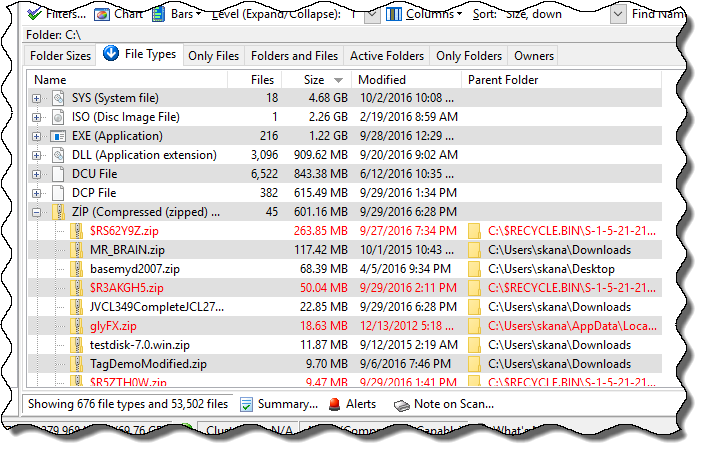 Scan is cancelable: Scans to find folder sizes can be time consuming on huge drives. ShowSize provides a Cancel Scan feature to save your time if you change your mind and want to cancel out of scanning a huge folder. For example, you want to then resume scanning on smaller subfolders. How to save a directory listing to a file and view it later. You can save complete lists to view and analyze them later, even on a different system. 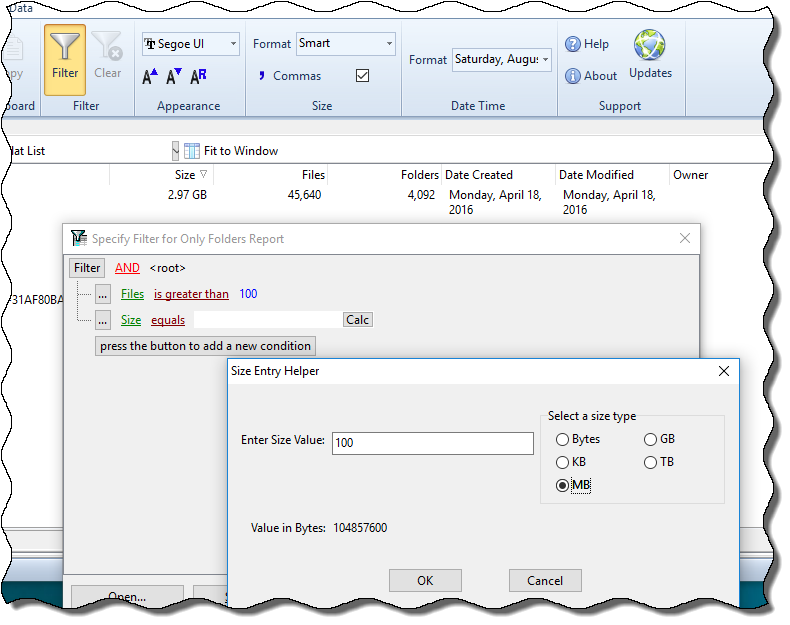 Do advanced filtering on the saved lists: Paid version includes an additional program ShowSize Analyze that allows you to do advanced filtering on the saved reports. The screenshot shows ShowSize Analyze. Innovations such as, Exclude folders, cache of scan and huge capacity have already been described earlier. This is the END of this presentation. Please download a trial copy of ShowSize and explore all these features to get a first-hand experience of their benefits. Save a directory listing to a file and later view it on any system. Easy to send and share with other admin users. 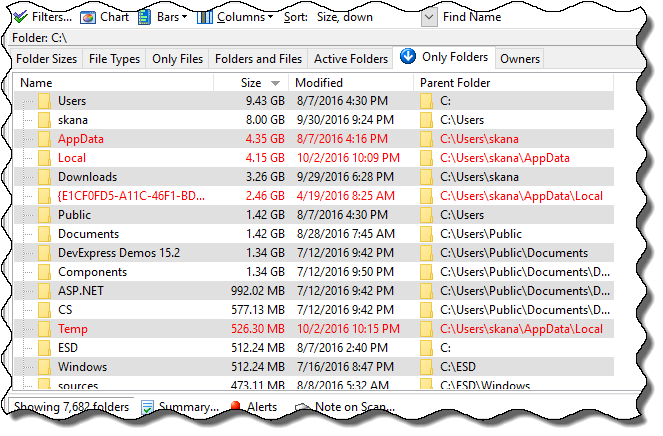 Save your time by excluding standard big folders that you shouldn't clean up or that you don't want to analyze. Apply advanced filters to find the information that you need. For example, show files greater than a certain size and modified between two given dates. A Top Items Chart that shows only the most significant items to give you an uncluttered view of the largest items whether they are folders, file types, files or file owners. For more details, please see the Features page. 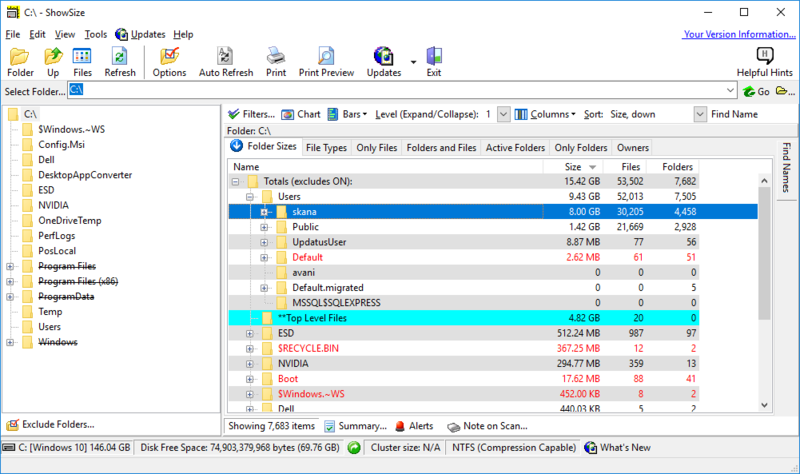 The following screenshot is of an earlier version that shows the Folder Sizes list on a Windows 10 computer. For complete details on the features used, please see the slides at the top of the page.